The Otter Banks Lake House is lakefront living at its finest! Located along the eastern shores of Mercer Lake just 1.5 miles from Hwy 101, this fabulous 4 bedroom 2.5 bath 3100 sq. ft. home can sleep up to 12 guests. 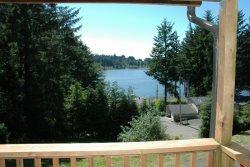 It is well appointed, sparing no expense and encompassing the beauty of Mercer Lake with unsurpassed views. Comfort, style, and luxury living come together in the many details around this striking home. Bring your boat or water craft and enjoy one of the finest lakes for fishing and play along the Florence Oregon Coast. Fish right off the dock for Largemouth Bass, Perch and Rainbow Trout. The kitchen has everything you’ll need to prepare your meals, including a dual temperature wine fridge. The main living area features an open floor plan combining the living room, kitchen, and dining room, allowing for perfect casual family living and easy entertaining at the dining table and breakfast bar. The spectacular panoramic view from the lakeside wall to wall windows on both floors creates a perfect backdrop for any event. The Master Bedroom located on the main floor offers your own personal view of Mercer Lake, a separate deck and entrance, and a heated soaker tub with TV in the Master Bath invites you to relax, soak and unwind. Relax on the love seat at the end of the day with your favorite glass of wine while watching stunning sunsets of gold, orange and purple. The upper floor offers options to entertain or wind down in the evening. Grab a drink at the mini bar upstairs and head outside to the balcony to enjoy views of the lake and surrounding hillside. Sit out on the large balcony and enjoy your morning coffee as the sun warms the waters and the lake comes to life. The balcony is also the perfect spot to relax with a refreshing beverage and enjoy the evening’s last rays across the waters. Inside there is a 7 in 1 game table with air-hockey and big screen TV with plenty of seating for all. A private dock and sandy lakeside beach steps away from the home. Holidays - Minimum 3 Night’s Stay!! !